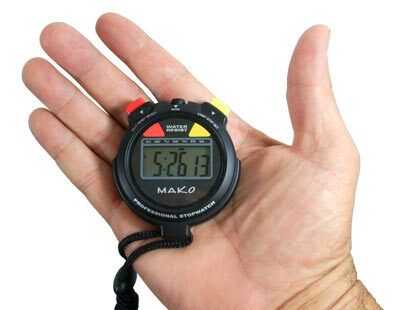 Make it a "two pack"
First, Select Make it a "two pack"
This is a professional grade stopwatch for breath hold training. Perfect for doing your A and B tables, this water resistant MAKO Spearguns stopwatch features oversized start stop buttons, an extra large LCD display, and neck lanyard. To make doing your tables easier, we offer a “two pack” at a reduced price so you have one stopwatch for your hold and one for your recovery. We use them at the pool for statics. Easy to use and read. Simple to use, good deal.